Infinity high frequency chargers are built specifically to match your battery size and application. Do away with the one size fits all mentality and get the high rate opportunity charger that matches the demands of your operation…the SuperCharger SHO. 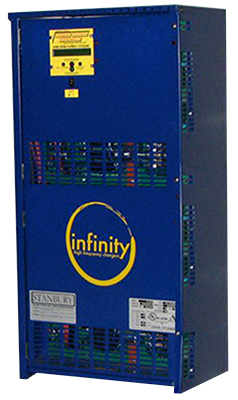 Infinity high frequency chargers utilize a full bridge IGBT switch mechanism to create the most pure DC output available from an industrial battery charger today. This means the highest energy efficiency in both energy conversion and effective energy storage. It also means the least battery temperature rise per DC Amps delivered. SHO chargers come equipped with single or dual cable per user specification, auxiliary contact connectors and battery temperature sensor probes to monitor and protect the battery while on charge.